$6.99 to $149.99 & FREE Shipping on orders over $59 $35. The Acquamark cork line is a high quality colmated cork. 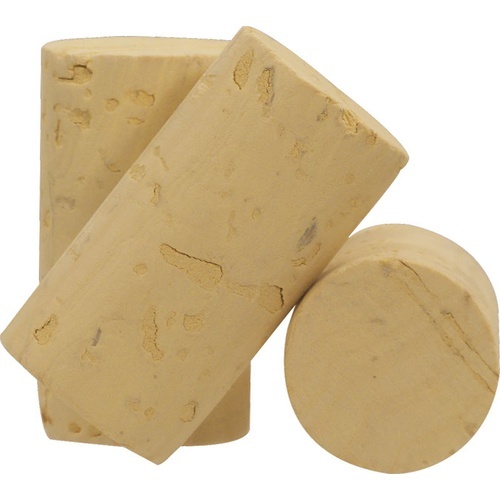 These corks have the ageable lifespan of Natural Cork, but are closer to the price of an agglomerated or overrun cork. Colmated corks are Natural Corks that were not quite flawless enough to make a grade, but are then filled in with agglomerated pieces, resulting in an ageable, but economical cork. The agglomerated corks have extra chemicals, so I went with a non-agglomerated cork. Nearly same price as agglomerated corks. I like real corks but need economy so I thought I thought I would try these. Will be bottling Souvignon Blanc which is to be drank young. No ageing. This corks should be good up to 3 years and more. Quality for my term of use. These #9 corks appear significantly larger in diameter than #8, will these work in standard wine bottles? BEST ANSWER: Yes, these do work in standard wine bottles. I use a floor corker and standard bordeaux style bottles with these every year without problem. The only additional comment I would make is the quality of these corks has varied. Some batches appear to have had far more imperfections and thus more filler than other orders. That being said I have never had any leakage or other issues and they appear in fine condition when removed several years later. Ive had no issues. I've used over a hundred of them at this point. I've used them in standard burgundy and Bordeaux bottles, the fancy tapered Bordeaux bottles and the tall elegant 375ml bottles. Yes they fit regular wine bottles. I use a floor corker and had no trouble. I re-use commercial bottles and they have worked great so far. For this cork, the price is very very good. For many years I have used the "Overstock corks". The Acquamark corks are 1/4 in. shorter, but the Acquark corks are solid cork and would appear to be of excellent quality. Although I have not yet done any bottling with them, I expect to bottle about 500 bottles within the next 3 months. These corks compress the same as any #3 cork, no leaks. great value. Yes very nice corks - no complaints ! Great cork - good looking. Easily inserted into bottle. Seal looks good. I order these corks directly from Amorim normally but every now and then I run short by 100 or so. When that happens I get them from MoreWine. The quality is outstanding, the look is professional. These are the exact same corks at a similar price to what you'd get from the manufacturer. Good corks this far. They seem to get a good seal and slide out of the bottle with ease. The proce point is great considering the quality.